Star Jacker is an early vertical scrolling shooter with some interesting characteristics. The player starts out with three fighters with all of the fighters moving and shooting at the same time. Two fighters trail the lead fighter. 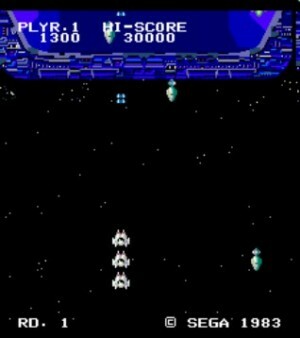 Star Jacker features a similar scheme with the Namco game Xevious in that the fighters shoot at enemy fighters in the air while dropping bombs on enemies and targets on the ground level. When any of the fighters is killed, the game momentarily pauses and re-centers the player fighters before continuing at the same point. The game is over when all of the player’s fighters are destroyed. Star Jacker allows no continues.